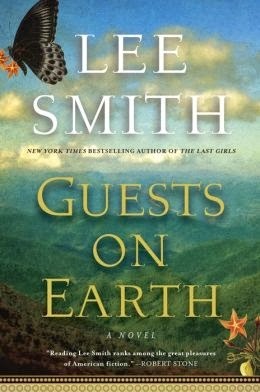 Lee Smith is a perfectly engrossing author, and one who easily captures the heart and imagination in a folksy, down-in-your-heart way. I've been fascinated with stories about Zelda Fitzgerald all summer long, as you know. This novel by Ms Smith has a different twist as it's seeing Zelda through the eyes of a young girl throughout her life who is actually raised as an orphan in Ashville's Highland House sanatorium. The really strong kicker of this book, however, is the extension of mini-vignettes of other patients at the hospital connected to the orphan, Evalina. The different characters' mental illnesses mesmerized me. Their manifestations weren't always evident at first glance which made it even more intriguing. The characters were respectfully and beautifully drawn. In fact, this book will be so memorable in that respect to me. Often mentally ill people aren't as kindly written or talked about, or even as well understood whether in literature or in the "outside" world. The showcase character of this book wasn't Zelda as I had expected. While she popped up as a main figure at times, and she was always on the mind of the main character, Evalina, she wasn't the focus of the novel. I found this not at all a problem. It really didn't take away from the interest of the story, though when she was included, it was like salt to the whole and was a point of clarity that Zelda was only one of many who suffered from a mental disorder. The sections that told of Zelda and Fitzgerald and their intimate times observed were sweet and sorrowful, capturing the essence not only of their relationship, it seemed, but of so many relationships that flounder under the heavy blanket of the mental heartbreak. I thought these were especially lovely passages. This is a book that flows easily from the pen of Lee Smith to our hearts. I loved the many characters, the story it told and the hope it engenders about the future of those who suffer mental illness. It spreads a good message that those who walk that path are special people who are just like anyone else, but who have to overcome injuries like many on earth do, as well. It speaks to their courage as well as those injuries and flaws. I loved this book and hope many of you will be inspired to pick it up to read this year. I didn't realize this book featured Zelda. It sounds terrific!